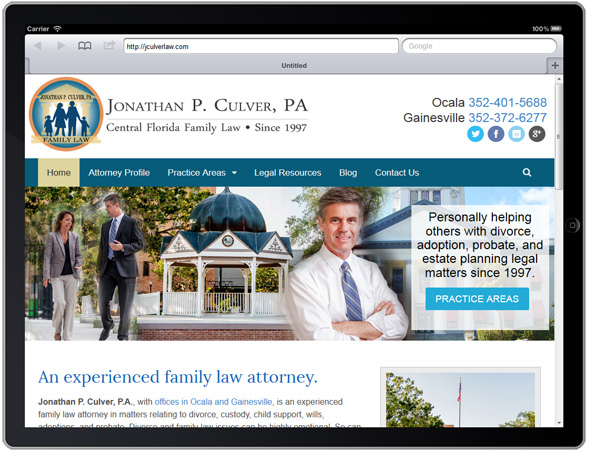 Jonathan P. Culver Law Firm, with offices in Gainesville and Ocala, Florida is proud to debut our new website. We worked with a local digital agency to provide a clean, mobile-friendly user experience for our clients and visitors alike and are very pleased with the results. We’re excited about the new look and features and hope that you are too. We plan to make regular blog postings to keep you informed of recent developments in Florida family law, to provide useful information, or just to share interesting articles around North Central Florida. We invite you to take some time to look around and get to know us. If you are dealing with an issue that requires legal assistance in the areas of family law and estate planning, please contact us and we would be glad to assist you.